Quilting Gallery hosts a weekly quilt contest. This week’s contest is Quilts for Little Girls. I entered Kallikats. Me: What other colors do you like? Me: Ok, what types of things do you like? So off to the show I went with the intent of picking fabric and a pattern to make my niece a quilt. The pattern is Yellow Brick Road. The cat silhouettes are from a Tuxedo Cats. It was in The Quilters’ Magazine – I’m not sure which issue. If I remember correctly the quilting was pretty basic. 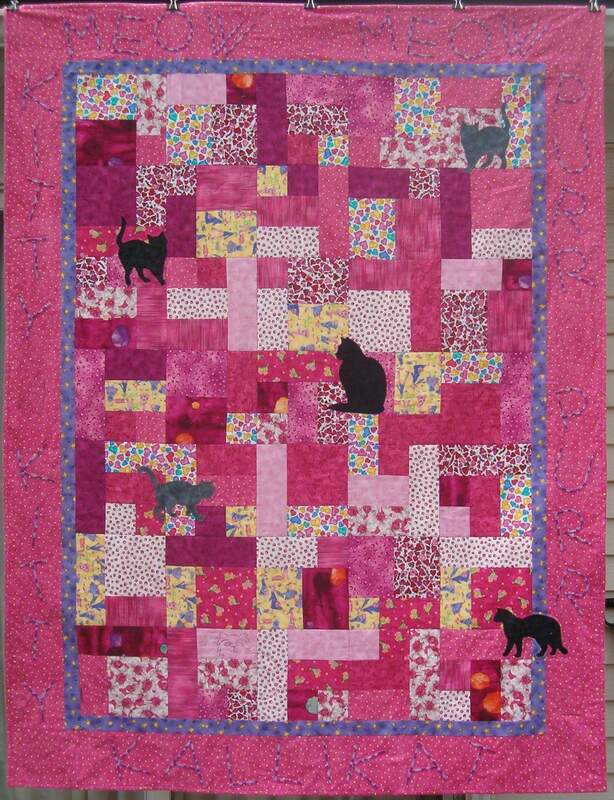 Stitch in the ditch between the blocks, outline the cats and maybe one or two cat outlines and a mouse in the center of the quilt. In the border I machine satin stitched block letters. The top border says MEOW MEOW. The left border says KITTY KITTY, the right border – PURR PURR and the bottom KALLIKAT — our nickname for Kalli. My best guess is the quilt finishes at 69: x 96″ based on the pattern and that I added an extra border. Kalli just got her room redone and the quilt fits in perfectly. If you would drop over to Quilting Gallery and vote for my quilt — and two others. They are giving away FQs to the top 3 quilts and I could always use more fabric. I always like to read the stories behind the quilt. Thanks for sharing. I forgot to vote for the other two, opps!